This is a stunning inlaid “Yei” figure pendant. 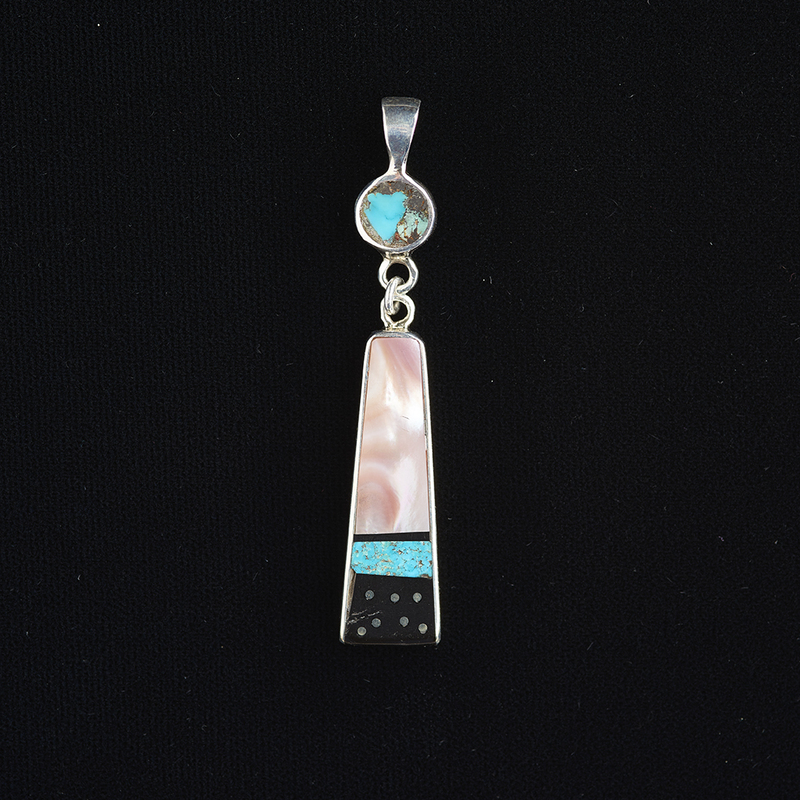 So modern looking with the silver dots inlaid into the black jet on the bottom of the pendant. The color and stone combinations are bold and elegant. 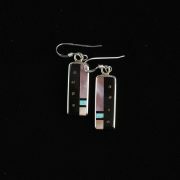 Inlaid with turquoise, jet, silver, and a pinkish mother of pearl body, it is very beautiful. Jimmy Poyer was born in 1954 close to Mexican Water, Arizona and was raised near Red Mesa, south of the Four Corners. His traditional Navajo family upbringing gave him a strong sense of values. He attended high school in Shiprock and did well in school. He spent a few semesters at BYU and University of New Mexico before deciding that college was not for him. Instead, he felt the lure of travel and his first love, music. He began to work as an apprentice to renowned jeweler, Jimmie Harrison, when he wasn’t on tour. It wasn’t long before he began to make jewelry on his own, borrowing the inlay style from Harrison, but creating his own unique Native American designs. 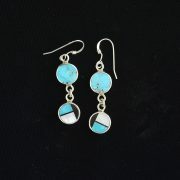 Every piece is built by hand from sheet silver, wire and natural stones. He is especially known for his creative bears, and use of colors.